I've previously blogged about my alterations to my 18th Century wardrobe to make it more maternity-friendly, but as my planned Re-Make, Re-Use, Re-Fashion project did not come about in time, I'm entering my stomachers for this challenge instead. I made them to go with each of two 18th Century jackets I already owned - the 1785 Block-Printed Jacket and the Green Swallowtail Jacket. I simply made a sleeve of my green fabric and slid the block-printed stomacher inside, then slip-stitched the top closed. Two for the price of one! Now either jacket can be worn over my maternity stays. All I have to do is unpick the top edge of the green fabric and pull out the block-printed one inside! The Challenge: Re-Make, Re-Use, Re-Fashion - fulfilled because I created a piece that allows me to continue to wear two jackets that no longer fit over my baby bump. I'm counting this as a "re-fashion" of the original garments. Also, piecing scraps together seems like it fits the spirit of the challenge. How historically accurate is it? The stomacher itself is historically accurate, though I'm unsure of whether or not it was ever used in this manner. I have no documentation for using a stomacher to increase the girth of a jacket for maternity wear, but it made sense to me. Hours to complete: The first one took maybe 1.5 hours, but that's because I had to piece my scraps together to get a large enough piece for the front. The second one took maybe 20 minutes, tops. My First Historical Sewing Workshop! 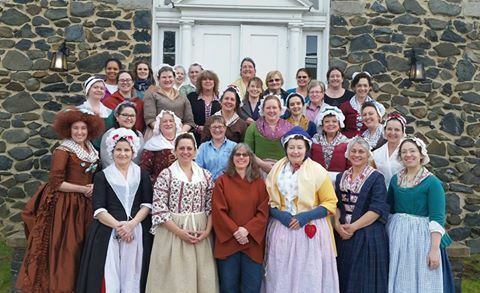 Last weekend I attended the Mitts, Muffs, & Hoods workshop in Savage, Maryland. I carpooled up with Melissa and Elyse, who both work at Colonial Williamsburg (and I'm just now realizing I didn't get pictures with either of them! Shoot). I had a lovely time! I got to make new friends and hang out with fellow historical costumers I hadn't seen in almost a year. Plus I learned some new information about staying warm in the 18th Century, as well as new sewing techniques to make my winter accessories more historically accurate. It was also fun to join others dressed in 18th Century clothing and hand-sewing using 18th Century methods! Carolyn was also the keynote speaker, and looked fantastic in her Italian gown! She talked about the various garments women of three different economic and social classes wore to keep themselves warm in 18th Century winters. She had many examples in portraits and fashion plates - as well as some extant garments in museums - in a Powerpoint presentation. Vicki walked us through her detailed, step-by-step instructions with Powerpoint slides in addition to the printed directions in our handout packets. We all try on our hoods. She helped people with fitting, as the smaller of the two hoods is meant to be worn very close to the head, being a practical garment intended to keep the ears warm. The front edge can be folded back to show the contrasting lining around the face, and the drawstring at the neck can be drawn up for a closer fit. I also loved the little cape/peplum option. I think this one was Vicki's. Sarah walked us through the construction of a basic muff base and a removable, embellished cover. She talked about historically accurate options for filling the base, such as wool roving and down. One thing I learned was that often the muff bases were just a flat "pillow" that you could roll up to slide inside a cover, which makes it more versatile if you have muff covers of different sizes. Also, a flat pillow takes up less space in storage than a round base. I had brought my muff base (stuffed with very period-inaccurate poly-fil) and the first cover I had made for it, and I had originally intended to just make a new cover for it. But now I want to make the flat pillow style, stuffed with wool roving! A couple of the participants had brought wool that they were either selling or giving away, so I got enough to make myself a new muff base. I will blog about all of my projects from the weekend separately, as soon as they're finished! That's right, I didn't complete a single project all day. I was very productive, though! They are all in various stages of completion. This building - Carroll Baldwin Hall - was built in the 1920s as the Town Hall (I believe), and has a very lovely Colonial-revival style. I loved the big windows that let in so much natural light! As you can see, my petticoat gaped a bit at the pocket slits - which made getting into my pocket a bit easier, actually! If I had had time, I would have made an apron to cover the front and sides so you wouldn't notice, but oh well. As it was, I barely had time to throw together a stomacher for my Green Jacket. I ended up just making the shell of one, slipping my newly-made block-printed stomacher inside, and stitching the top closed! :p But it worked. And I've already blogged about my maternity stays and how comfortable they are. I seriously might start wearing them as a daily thing! I hope to have it done in time to wear to the annual Francaise Dinner in March. I had so much fun last year, and it'll be more difficult to attend next year when I will have an almost-one-year-old. Plus I want to wear my maternity stays again. (And give myself incentive to finish them properly.) :p But since I am pregnant, I cannot wear the gown I wore last year. However, because a robe a la Francaise has internal ties at the center back, I figure it has some flexibility in the fit! I shall endeavor to make it large enough to fit me now, but not so large that it doesn't fit me again after the baby comes. Wish me luck! The idea for this particular gown came about in August 2015 when I visited a very upscale thrift store called The Velvet Shoestring in Williamsburg. I went because I had been told that they occasionally carry fabric, and I was curious. Well, I didn't find any fabric, per se, but I did find six matching curtain panels that turned out to be 100% silk! Needless to say I bought them all. And they have been calling out to me to make them into a Francaise gown ever since, but I've been too intimidated by the prospect to get started. However, now is the time! I know silk shantung is not historically accurate to the 18th Century, but I'm going to pretend it's taffeta. It has such a lovely drape and sheen, and that color! It's hard to capture in photos, but it's a gorgeous gold color. I can just imagine how rich and decadent I'll feel wearing it! For those who are curious, I paid $14.50 for each panel (though they might have been priced at $29 for a set of two; I don't remember) for a total of $92.22 with tax. The panels were 50 x 84", but when I recently unpicked the hems on all four sides of one, the final measurement ended up being 52 x 92". This gives me a total of 15 1/3 yards of 52" wide silk! At $6/yard, I'd say that's a steal. My hand doesn't even show through! And it has just a hint of sheen on the right side, too. So this will work very well for the lining of my Francaise, as well. I have 14 yards total, since the lining is shorter than the outer fabric, but still! 14 yards of good polished cotton, essentially free! I foresee it becoming the lining for many future gowns. The stays are a bit off-center in these photos. Pay them no mind. And I got the center front edges to overlap enough to pin them together! Still a pretty good fit! The wrinkles are mostly from holding my arms out to hold the camera. I'm calling it good, as the center front edges will lace closed and be covered by the stomacher on the finished gown. So that's another area where I have room to grow. To be generous, I'm going to give it a full two inches when I cut out the lining. That's next! I just wanted to share my excitement about this planned gown. I don't think I've done anything of such an ambitious scale since my wedding dress! Certainly that was the last time I worked with such a large amount of silk fabric. But the creative juices are definitely flowing again. Stay tuned for more progress! I'm sure everyone is interested in how my maternity stays came out - particularly if you've been following me on Instagram. I am happy to say that I wore them this weekend and they worked beautifully! They are not 100% finished, as they do not yet have binding and I'm missing a few bones here and there, but they were wearable for one day. I did quite a bit of research on these stays, which you can see on my Pinterest board of 18th Century Maternity wear. I also found the photos that Wm. Booth, Draper recently shared on Facebook to be helpful for the construction process. I then realized that the channels would extend down beyond the turned-over seam allowances into the tabs, which meant that the bones would need to go between the front two layers of coutil, and not between the second and third layers as they would at the center front and center back edges. Therefore I trimmed away another layer of coutil to further reduce bulk at the side edges. It was at this point that I stopped to count up all of the eyelets that I was going to need to sew. I do not have an eyelet attachment for my sewing machine, so these would need to be worked by hand. All sixty-six of them. This was on Thursday, and the event to which I intended to wear the stays was on Saturday. I documented my progress on Instagram, under the hashtag #neverendingeyelets. But at last they were done! And of course I was leaving for Maryland the next day. :p Fortunately I wasn't leaving until the evening, so I was able to complete the next step - stitching together the pieces - again by hand. I needed to add all the boning, and finish lacing up the rest of the edges. I have no photos of this work, but I used zip ties from the hardware store for the boning. I cut them to size with my Super Shears, rounding down the sharp edges with a heavy-duty nail file. I boned every other channel, for the most part. The center back pieces are probably the most heavily-boned, but I found that I had made a mistake by fully constructing the stays before some of the bones were inserted, and the seams closed off the edges of a few I needed to get into. So I left those out. Once the ends dried I was able to fully lace up my stays and try them on for the first time! Very exciting. It was also nearly 1:00 AM. :p They had better fit, because I was out of time! The good news is, they did! And I could get into and out of them by myself, thanks to the front-lacing feature. Now I never want to wear back-lacing stays again! They will look much better after they have binding and welting on the seams. I did stitch a quick basting line around the bottoms of the tabs to keep the bones from slipping out of those channels, and dabbed a bit of clear nail polish at the tops of the slits in between tabs, to keep the fabric from fraying too badly before I get the binding attached. This is approximately how they fit on me. I wrapped the long end of the front lacing around my waist, tying the end where it overlaps. This knot can slip along the cord if I need to adjust the front lacing at all. The two ends of the side lacing edges got tied together in front. I found the stays very comfortable for all-day wear! They provide good support at the bust, and do not compress the belly at all. There is still a lot of room to grow in them, too. I can let out the front and sides while keeping the back lacing right where it is, which is helpful for dressing myself. I am calling this venture a definite success! And I look forward to wearing them two or three more times before the baby is born, so stay tuned for more adventures in 18th Century maternity clothing!